On April 4, the Haitian government announced that Michel Martelly won the recent fraudulent “elections” imposed on Haiti by the United States, France and Canada, the so-called “international community,” and sanctioned by the United Nations. He did receive 67 percent of the vote, but fewer than 25 percent of the electorate went to the polls in a record low turnout. First round voting took place on Nov. 28, 2010. Voter rolls contained the names of many of the 310,000 people who had died in the earthquake, and people had no idea where to vote. The number of polling places was reduced from around 12,000 in the last genuinely democratic election in 2000 to fewer than a thousand this time, helping to create the appearance of a large turnout while keeping turnout low. Official results claim that 23 percent of the electorate voted, but on-the-ground observers claim turnout was much lower. By noon, 12 of the candidates, including Michel Martelly and Mirlande Manigat, had joined together to denounce the massive fraud and demand the “elections” be cancelled. That evening, however, Edmond Mulet, head of the U.N. occupation force in Haiti, called them both to say they were in the “run-off,” and they withdrew their opposition. Then the results were announced: Manigat first, Jude Celestin, the favorite of then-current President Preval, second, with Martelly a close third. The “international community” sent an electoral commission from the Organization of American States to “recount the votes.” A report by the Center for Economic and Policy Research states: “The amount of votes not counted or counted wrong in this election is huge … Based on the numbers of irregularities, it is impossible to determine who should advance to a second round.” Nevertheless, the OAS decided the “run-off” should be between Manigat and Martelly, in spite of several violations of Haitian law, and Hillary Clinton personally went to Haiti to enforce the message. Significantly, on Jan. 16, former dictator Jean-Claude (Baby Doc) Duvalier returned to Haiti from France, made only more relevant by links of both candidates to Haiti’s Duvalierist past connections, which have been unreported in the international press. Martelly’s ties to the former dictator can be traced to his youth – he joined the Duvalierist death squad, the tonton macoutes, at the age of 15. He later attended Haiti’s military academy. Under Baby Doc, Martelly, a popular musician, ran the GARAGE, a nightclub patronized by army officers and members of Haiti’s tiny ruling class. After Baby Doc’s fall in February 1986, a mass democratic movement, long repressed by the Duvaliers, burst forth and became known as Lavalas, from which emerged Aristide, who was elected president in 1990 by 67 percent of the vote in the first free and fair election in Haiti’s history. Martelly’s candidacy had significant backing from an anonymous Florida supporter who hired the Spanish public relations firm Ostos & Sola to manage his campaign. This same company secured Felipe Calderón the presidency in Mexico and worked on John McCain’s campaign, so there are powerful forces behind Michel Martelly. In his first visit to the United States, Martelly met with Secretary of State Hillary Clinton, officials from the IMF, the World Bank and the InterAmerican Development Bank, indications of where his allegiances lie. Clinton stated the U.S. is behind him “all the way.” Since his return, Haitian police have violently obliterated three camps of internally displaced persons living on public land in the Delmas neighborhood of Port-au-Prince, destroying belongings and violently beating people with batons. In his visit to Washington, Martelly announced his intention to reconstitute the Haitian army, disbanded by President Aristide when he left office in 1995, one of Aristide’s most popular decisions. The Haitian army grew out of the Garde d’Haiti, created by the United States Marines after an almost two decade-long U.S. occupation that ended in 1934. It was developed from the model of the Nicaraguan National Guard, which was established the year before to secure the dictatorship of Somoza after the Marine occupation of that country. 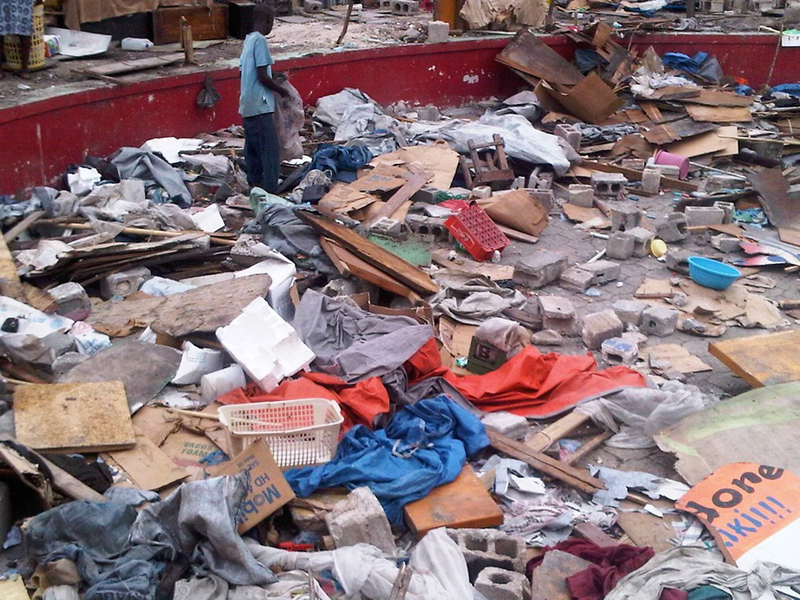 Haiti now finds itself at a crossroads. On one side is the Lavalas movement, which has won every honest election in which it has participated. Aristide put the needs of poor Haitians ahead of the demands of international and national elites, though by doing so he created powerful enemies. (See Haiti Action Committee’s “We Will Not Forget.”) The Haitian majority has tasted real freedom and democracy and will not willingly return to the bad old days of Duvalier, which makes the army restoration all the more ominous. On the other side is Haiti’s tiny elite, supported by the “international community” and a 12,318 member U.N. occupation force. They rigged these “elections” in a desperate effort to present an illusion of democracy to the world and to insure that transnational corporations will not find their power and privileges in any way limited in Haiti. They have selected Martelly as the new face of this repression, paid for by an anonymous millionaire in Florida. Baby Doc lurks in the background while he dines in fine homes, unable to leave the country, as a court decides whether or not to charge him with corruption and embezzlement, while ignoring his far more significant crimes against humanity. The choice could not the more clear: The twice elected Aristide vs. the never elected dictator Duvalier. The impoverished majority vs. an entrenched elite backed by international bankers. A nation born of rebellion against African enslavement vs. the countries of the former slave masters. An economy for all vs. an economy for a few. One person, one vote vs. might makes right. Unarmed demonstrators vs. tanks and death squads. Haiti needs to be part of the larger global conversation about democracy and repression, so present in world consciousness with the Arab Spring. As in Egypt, Bahrain, Yemen, Libya, Syria, Honduras, Uganda and other countries, Haitians have been shot dead in the streets protesting, ever since a military occupation overthrew the overwhelmingly popular, twice democratically elected President Aristide in 2004. Charlie Hinton, a member of the Haiti Action Committee, may be reached at ch_lifewish@yahoo.com. Previous articleLiving on this earth 95 years! Next articleCynthia McKinney: We are now under attack in Tripoli! You are a fool, Aristide has done nothing positive for the poor or the country. He was involved in drug money laundering and killings of thousands of people in just 6 years of being in power. I do not trust Martelly and I would have rather see Mrs Manigat as the president but you are just too damn or maybe you are blinded by your allegiance to Aristide to even consider him as a legitimate leader. Bondye sel ki konnen ki jan Ayiti ka sove nan mize` lye la. Stop the smear campaign!…..After almost a year, I have yet to see any investigative reports done on any of these claims against President Martelly….rumors don’t count as real work of journalism. I don't understand this argument on low participation at the polls when a country just suffered a major catastrophe…no one seems to take that into account the priorities have changed for the people who are living under pile of rubles, coping with death, destruction, grieving for their family and friends. All we can think about is to delegitimize everything step the country is trying to take in order to recover and move forward. I’m interested to know how Martelly’s administration is governing the country. MARTELLY IS JUST ANOTHER USA PAWN. GOD HELP US, HAITIANS. This is typical "crabs in the bucket" mentality that has plagued black people all over the world. We just cannot give another black person a fair shake. It is either our candidate or no one else. Michel Martelly won this election fair and square. To insinuate that the American government put him there is doing a grave disservice to all those hungry, tired, disillusioned haitians who took the time to cast their votes. I stopped taking your article seriously the minute you started to praising Aristide. 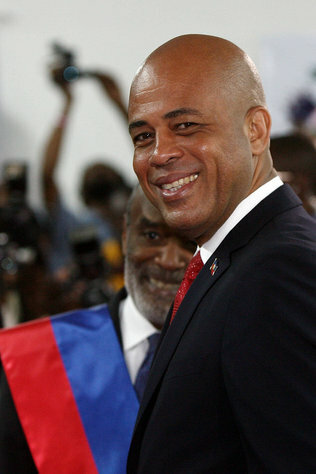 I have high hopes for President Martelly. He has been signaling to us in various of ways that his presidency will be different. Let's give him a chance and see what he can do. We have a part to play also. Se pa selman chita la avec deux plats mains nou ouvert ap tan deux goudin nan mains blanc-an….tout moun sipoze mete tet nou ensemble pou rebati vye peyi kraze nou-an…..